Since 1972 the OSPAR Convention has worked to identify threats to the marine environment and has organised, across its maritime area, programmes and measures to ensure effective national action to combat them. In doing this, OSPAR has pioneered ways of monitoring and assessing the environmental status of the seas by setting internationally agreed goals and by agreeing commitments by participating Governments to deliver what is needed. “Thank you to all of you for helping us with the new website. You’ve all been fantastic from start to finish and made the whole project really straightforward and enjoyable. Since the website has gone live I’ve received a lot of very positive comments. The previous OSPAR website had an extremely dated design, and it was difficult to navigate and use, a particularly significant problem given that the site was home to a library of several thousand documents which needed to be readily available to visitors. OSPAR required a modern, mobile-friendly website which featured a great amount of content which had to be laid out in an intuitive way. Furthermore, it became clear that the database library would need to be completely re-worked, both to improve the ability for OSPAR to manage the documents, but also to make them easier to find for front-end users. NB delivered a brand new, fully-responsive site featuring clean design and clear navigation systems to help users access a large volume of information in an extremely accessible way. In addition to the core content for each ‘work area’, the site also features a significant archive of meetings, publications, news and downloadable documents. In total, over 20,000 documents are stored and shared via the website, and this number has continued to grow since the site’s launch in 2015. Our team’s database skills contributed towards the success of this site which was extremely well received by the client and users. 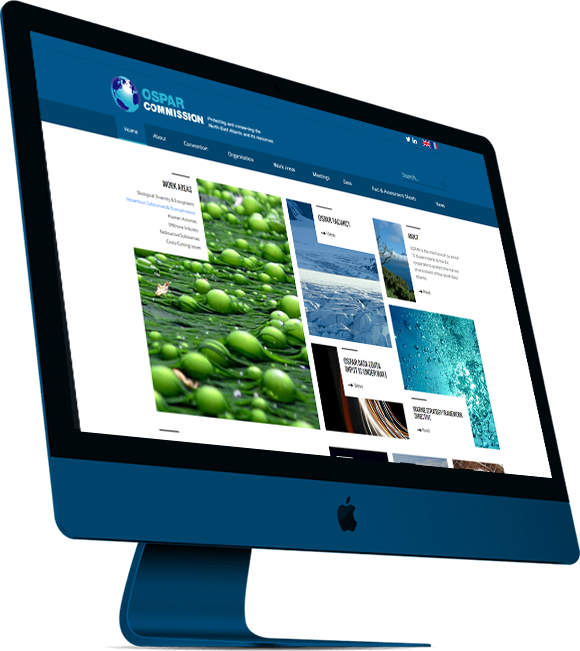 Since the launch of the OSPAR website in early 2015, we’ve regularly worked alongside the client to continually improve the website. A recent project involved the building of OSPAR’s ‘MAP Matrix’ into an attractive and searchable page which allowed the visitor to filter the field content and choose what fields they would like displayed, with a method of printing/exporting the selection. At present, we are working alongside OSPAR to design an offshoot section of the website called the ‘Intermediate Assessment’, which will effectively display key information and statistics in an attractive manner and can be used as the basis of future presentations the organisation puts on. We hope that the new site will be live around August 2017.